Clever birthday wishes, when done well, are the perfect birthday messages to send to that special someone who likes a good pun. Those are the only kind here. What makes these birthday wishes so clever? Basically, three ingredients: lots of humor, a few pus and an unexpected turn of phrase. Just how much you should have of each ingredient comes down to what you want to say to the birthday boy or girl, and what he or she will appreciate (or, of course, understand). Too much cleverness can be too cryptic at times. 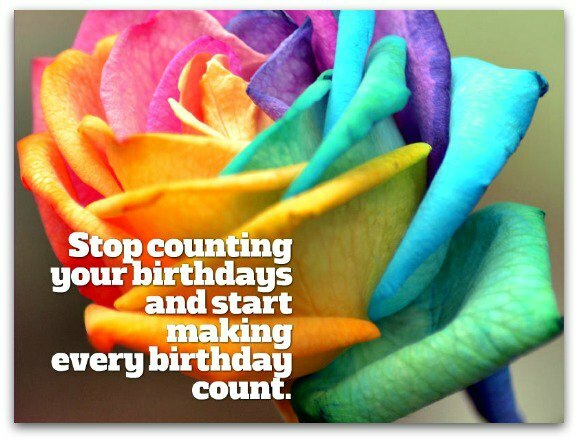 If you think you need a few more tips before you start your search, just take a minute out of your busy day and check out Message Guy Tip #42, which is packed with helpful hints for choosing the right clever birthday greetings. You deserve to have the respect that comes with your age. Unfortunately, life isn't fair for old fogies like you. Happy birthday! You're still young, relatively speaking — you'd be hundreds of years old if you were a dog. Happy birthday! The wonderful thing about growing up with you...is the proof I have to nail you on your special day! Happy birthday, sucker! Happy birthday! Everything looks so amazing on you, especially when you wear your heart on your sleeve and a big smile of your face. Happy birthday! My birthday wishes for you come down to two words: always and never. May you always feel joy — and may you never know sadness. Birthdays are like the dark. The more you have, the less you see! Happy birthday! This is one of my top picks because it pokes fun at the aging process in a witty, unoffensive way. Not many middle-aged women or men would be insulted by this message. Instead, it will likely tickle their funny bone (they may even commiserate with you if the two of you suffer from age-related declining vision). Happy birthday! At your age, you should really stick with the "big things in life"...like big print. Happy birthday! 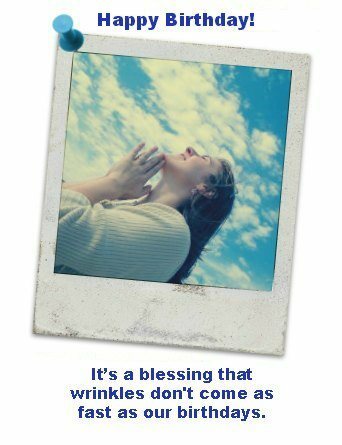 It’s a blessing that wrinkles don't come as fast as our birthdays. Happy birthday to a wonderfully, beautiful, sensuous woman! Women at your age don't have hot flashes — they're just hot. Happy birthday. So what if you're almost a senior citizen. The older you are, the better the seats you get on the bus and subway! Happy birthday! 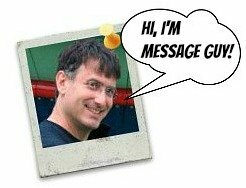 There’s a definite moment when you can no longer deny you’re getting older: the moment you start to use decade-old shots as your Facebook, g+1 or LinkedIn profile photo. There is still no miracle cure for the aches and pains of getting older (but napping all day comes close). Happy birthday! You can still be very clever! Happy birthday! Youth comes in many shapes and sizes. For wealthy men, it’s a trophy wife. For the rest of us, it’s a distant memory. Happy birthday! You're only young once, but you can act like a reckless teenager until you are destitute or, worse, celebrate your 25th anniversary as a McDonalds employee (whichever's first). Happy birthday! If age is all in our minds, like everybody tries to tell us, why do we feel more and more aches and pains all over our bodies every year? Happy birthday! You know you're middle-aged when one of life's greatest temptations involving your bed is napping. Happy birthday! At your age, younger coworkers at your company will certainly take you seriously — since they certainly won't get any old jokes of yours. Happy birthday! You know you’re getting older when sowing your wild oats means pouring oat bran cereal into a bowl for breakfast. Happy birthday! We senior citizens shouldn't think about what we can’t do anymore. We should think about all the things we can do that youngsters can't — like hogging the middle lane and getting senior discounts! Happy birthday! At our age, it’s never a good idea to look up old girlfriends or boyfriends — you've likely forgotten why the relationship didn't work out in the first place. Happy birthday! Don't worry about the fact you've been around the block too many times — at our age, nobody cares or, more likely, remembers!